First day page 9: Ninth stop, Simantadwip, Simuliya. After walking through sand dunes we reached Simuliya. 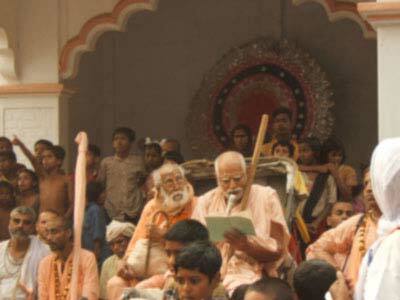 Sripad Bhakti Prasun Aranya Maharaj and Sripad Bhakti Kiran Giri Maharaj reading the Pastimes of Parvati and Lord Siva. "This edge of Nabadwip, here on the south bank of the Ganges, is known to saints as Simantadwip. In time, the Ganges will cover all but one small portion of this land. That place will be known as Simuliya, where the sensually-minded people will worship Parvati, the wife of Siva, as the Divine Mother. "Listen, and I shall tell you the history of this place. Once, in Satya-yuga, Siva, crying the Name of Sri Chaitanya, began dancing madly. At that time Parvati became curious to know who Chaitanya Mahaprabhu was. "She said, 'By seeing your astonishing dance and hearing the Name of Sri Chaitanya, my heart is melting. Up until now, I have only heard of materialistic tantras and mantras but these rituals simply lead to the soul's further entanglement in this material world. My dear husband, please tell me about Sri Chaitanya. I think that by worshiping Him, I may achieve actual life.'" Nityananda Prabhu continued, "While meditating on Sri Chaitanya, Siva heard the words of Parvati and replied, 'Unto you who are the divine energy of the Supreme Lord, a partial expansion of Srimati Radharani, I shall now explain the crest-jewel of all truths. 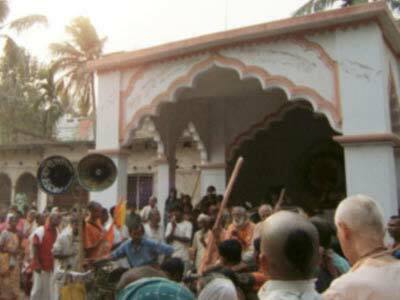 Accepting the mood of Srimati Radharani, the Supreme Lord will descend in the age of Kali at Mayapur as the son of Sachi. His beautiful body shining like a golden jewel, the Lord, intoxicated with His Pastimes of chanting the Holy Name in kirttan, will distribute the nectar of Divine Love. Alas for the fate of one who doesn't taste a drop of the flood of Love of Godhead! His life is wasted. Just remembering the promise of the Lord that He will come, I am drowning in the ocean of Divine Love. Unable to maintain my patience, I have given up my own city of Kasi and have come to Nabadwip. Here, on the banks of the Ganges, I will live in a hut and worship Sri Chaitanya.'" Nityananda Prabhu continued, "Hearing Lord Siva's words, the beautiful Parvati hurried to Simantadwip constantly meditating on the form of Sri Chaitanya and vibrating His Holy Name, she became immersed in Divine Love. Sri Chaitanya Mahaprabhu, in a mood of mercy and magnanimity, suddenly appeared before her with His associates. His complexion was the color of molten gold. His arms were long, His curling hair beautiful. He wore a long dhoti, folded in three places, and a garland of flowers swung from His neck. In this way He was very beautiful to behold. "Parvati fell at His lotus feet and with an agitated mind explained her sorrow: 'O Lord of the Universe,' she prayed, 'Although You are merciful to all, You are the cause of my distress. O deliverer of the fallen, You have given me jurisdiction over all living beings who turn away from You, and I must keep them bound in the material world. I have come into the material world to do this work and have thus been cheated out of the unlimited Divine Love that You are distributing. I am Maya, illusion personified. It is said that wherever there is Krishna, there is no Maya. Because of this I must always remain within the material world, outside Your spiritual realm. How will I ever see Your Pastimes? If You do not offer me a way, I am completely without hope.'" Nityananda Prabhu explained, "Saying this, the chaste Parvati in great anxiety took the dust from the lotus feet of Sri Chaitanya and placed it in the part in her hair. (This part in a lady's hair is called simanta and is anointed with vermilion at the time of marriage.) This is how this place became called Simantadwip. The common people call it Simuliya. "Being pleased with Parvati-devi, Sri Chaitanya told her, 'Listen carefully to My words, O supreme goddess. As My energy you are non-different from Me. My divine energy takes two forms. Within the spiritual world Sri Radha is the original form of My internal energy. When My divine energy manifests its external feature within this material world, Srimati Radharani, the supreme feminine principle, is represented as yourself. Without you My Pastimes could not be accomplished, for as Yogamaya in the spiritual world, your assistance is so necessary to enhance My lila. In Vraja you are eternally present as Paurnamasi, and in Nabadwip you are present as Prodamaya along with Siva, the guardian of the Holy Dham.'" 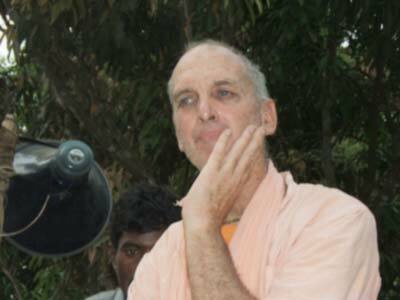 Nityananda Prabhu concluded, "Saying this, Sri Chaitanya disappeared. Parvati was overcome with the ecstasy of Divine Love. Filled with Love of Godhead, she remains there in her own form as the mistress of Simantadwip, and in her form as Prodamaya she stays in Mayapur." First day page 10: Tenth stop, Rudradwip. 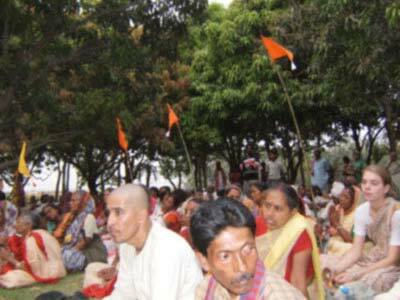 There was an invigorating breeze swishing through the trees as the devotees listened to bhajans. Sripad Bhakti Premik Siddhanti Maharaj, always present to kindly guide the Vaishnavas and help them feel welcome.